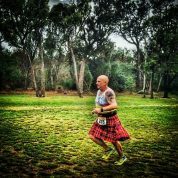 My name is Jason Nelson aka, ‘The Kilted Rogue Runner’. I am a Royal Navy veteran and an ex UK and WA Police Officer, I survive Depression, Anxiety, PTSD and associated issues. I’m grateful that I have personally suffered because it has given me the insight into the power of sharing my story to help others. During my life there have been many short stories of trauma that I have been exposed to, and the way I used to deal with them was by locking them away on my sub consciousness bookshelf. Sadly these traumas include being sexually assaulted by a person in a position of trust when I was young, active service in the Royal Navy, the tragic death of a dear friend on my stag night, the devastating loss of my Grandmother, to responding to numerous horrific incidents during a distinguished policing career with Cheshire Police in the UK and here with WA Police. For me, my policing career is from where most of the trauma I have endured still affects me to this day. These include seeing numerous dead bodies, traumatic scenes, delivering death messages, horrific road traffic collisions, observing autopsies and working on covert policing teams in high risk situations. While working on a covert policing team here in Australia my supervising officers, attempted to have me removed from the team for under performing by setting me up to fail during operations. This was happening within two years of moving to Australia and trying to settle my family in to our new life down under. Over a period of 6 months I became severely depressed and as a result I contemplated, planned and attempted suicide. On numerous occasions, in the darkest of that time, I placed the barrel of my loaded service Glock 27 pistol in my mouth with my finger on the trigger and gently squeezed. I was a mess. Thankfully with the help and support of my family I found the strength to report what was happening to me and sought the professional the help I needed, which, along with distance running helped me become mentally fit again. My roller coaster of a journey continued about 3 years ago I underwent surgery for a routine hernia repair, shortly after surgery I suffered a delayed reaction to the anaesthetic and my heart went from a resting 50bpm in my sleep to over 160bpm, the crash team was called and they worked frantically to reduce my heart rate as they readied the defibrillator to shock my heart back to normal rhythm. Unfortunately for me this was the event was the trigger point to all of the trauma short stories falling off my sub conscious bookshelf and reappearing in the fore front of my mind once more. I didn’t understand the symptoms and struggled to cope with what was happening to me, the flash backs, the sensitivity to noise, being hyper vigilant, paranoid and severe anxiety. I tried and failed to deal with it on my own and again became severely depressed and 3 months later had another breakdown. Again I sought professional help and after 12 months working with my Psychologist, and undergoing cognitive writing therapy I was able to desensitise myself to much of it and become happy again. I still suffer from some associated issues such as OCD, hyper vigilance and the occasional flash back, but now I recognise and understand my symptoms. Sadly, our family felt another blow from mental illness last year when our daughter Holly then 17, who had been suffering from depression and anxiety attempted suicide by overdosing on paracetamol and codeine. I’m so happy to say Holly is much better now, after getting the right balance of help and treatment, and in August Holly enjoyed her 18th birthday celebrations and is aiming to follow in her older sisters footsteps by becoming a nurse. Recently Holly showed great courage and strength when we both spoke about our experiences at a Cross-Fit event raising awareness for mental health and following on from that completed the Perth Half Marathon together. Having been through what I have endured, and survived, I now share my experiences, speak in public and at events about mental illness and help educate others to break down the stigma that surrounds it. It has also inspired me to undertake further studies to educate myself beyond my own experiences and I’m currently studying a CERTIV in Mental Health with WAAMH to gain further knowledge on how to help others. One of my greatest tools that helped me face mental illness head on, is distance running; and to date I have run 22 marathons and countless other events. Running to me is one of my most powerful mindfulness therapies, it gives me time to concentrate on my breathing as the sound of my feet strike the ground as I meditate. As a founding member of the Rogue Runners Club Australia and now a committee member for Sirens of Silence Charity. I raise awareness each event I run, by wearing a full weight Napier tartan kilt, with kind permission from my friends at the WA Police Pipe Band. Our Rogue running crew, was established here in Perth in 2011. The club is free to join with an ethos based upon fitness, fun, family, and fundraising. From our 4 founding members we now have over 120 members across Australia, New Zealand, the US and UK and to date we have raised over $75,000 for worthy charities. From 1 July 2016 the club made a permanent ongoing partnership to support the newly formed Sirens of Silence Charity (commonly known as SOS) to raise funds and awareness for our Police, Fire and Paramedics and their families who suffer from the effects of work related mental illness such as PTSD, Depression and Anxiety. The objective of the club is to become the go to running crew, through Sirens of Silence, for serving and ex-emergency service workers and the wider population who wish to gain improvement in mental wellbeing through running, fitness, exercise and nutrition advice.